Monitoring net exchange fluxes of greenhouse gases (GHGs) over agricultural fields is done either by chamber-based measurement approaches or using micrometeorological techniques. Chamber-based methods provide point-based measurements, but those can be customized and implemented at low costs in the field. Micrometeorological techniques, on the other hand, provide area-integrated measurement of gas exchanges without altering the natural canopy microclimate condition. With recent advances in instrumentation, fluxes can be measured at a very high temporal frequency of the order of hours to minutes. However, instrumentation is costly, often requires power supply and a homogeneous crop cover of a certain minimum area and knowledge of micrometeorology on the part of the user for a comprehensive GHG budgeting. Eddy covariance (EC) is regarded as the most robust micrometeorological technique which provides the most direct measurement of energy and GHG fluxes. This chapter mainly deals with CO2 flux measurement using eddy covariance technique. Guidance on various measurement protocols such as site selection, sensor configuration, and its orientation is provided. Sources of error in the eddy covariance data, data screening steps and various gap-filling measures such as mean diurnal variations, linear and non-linear regressions and look-up tables and flux validation have been addressed. 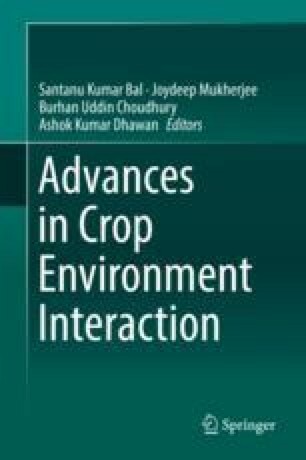 It further includes a brief review of GHG exchange dynamics over agricultural landscapes, emerging challenges and case study of flux monitoring in three different crop ecosystems of semiarid Deccan plateau of peninsular India.